about the media Material on a coach trip to the origins of the Bata shoe empire in the Czech Republic. about the project “Bata-ville” is a record of a coach trip to the origins of the Bata shoe empire in Zlín in the Czech Republic. By the outbreak of the Second World War the company had fulfilled Tomas Bata’s ambition to become “shoemakers to the world”, with factories in 30 countries including two in the UK - at Maryport (Cumbria) and East Tilbury on the Thames Estuary (Essex). 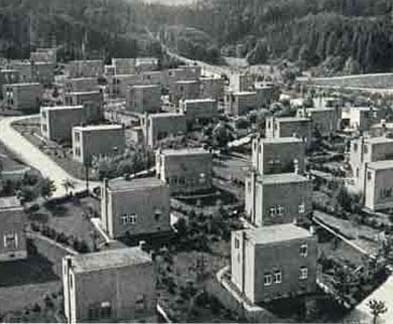 Early Bata factories were at the heart of progressive model townships of homes, shops and community facilities based on the original Bata town of Zlín. Against the backdrop of regeneration in their local communities, former employees of the now-closed UK shoe factories in East Tilbury and Maryport are led on a journey that begins as a free holiday but soon becomes an opportunity for a collective imagining of what entrepreneur Tomas Bata’s maxim “We are not afraid of the future” means for them in 21st century Britain. about artist and participants Nina Pope & Karen Guthrie are the writers and directors of “Bata-ville” and also appear as hostesses throughout the film. They have collaborated as visual artists for the last decade and in 2001 founded ‘Somewhere’ - which co-produced “Bata-ville”, their first full-length film. “Bata-ville” sees Pope & Guthrie reprise their roles as hostesses - first seen in their webcast project ‘/broadcast/’ (1999) where they produced a live interpretation of Chaucer’s “The Canterbury Tales” for Tate Modern (London). In “Bata-ville”, they appear in distinctive costume, adopting the roles of travel guides and interpreters for their passengers whilst also pursuing the film’s themes with the recurring question “Are you afraid of the future?”, posed to a succession of interviewees which include workers at an airplane factory and a cemetery. The artists Nina Pope (1968) and Karen J. Guthrie (1970) live and work in London and Cumbria. They have worked in collaboration since 1995 developing their own projects and more recently as co-directors of ‘Somewhere’. ‘Somewhere’ is an organisation which generates and promotes innovative cultural projects with a focus on collaboration, public access and new technologies often explored through live projects with both an on-line and ‘in situ’ audience.